There are two different sections for you to access, in order to edit contents sections. One from the green cog icon, on the right hand for each section, in the customizer. The other one is directly in the page Customizer Preview. From the green cog icon, you set up content section preferences, for specific customizations. This point is detailed in the document titled “Page Content – Customizations”. There are 3 options: drag, edit, delete. – This button allows you to reposition elements within the same column. Just drag the element up or down to move it upper or lower in the column. – if you click inside, you can both add your own text and adjust typography according to your preferences. – Delete an item by using the red trash button in the upper right part of the live editing interface. This button will not appear for some elements that cannot be removed. 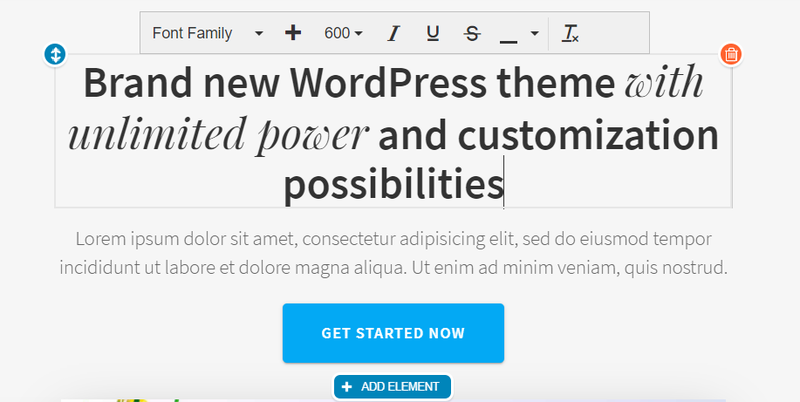 If you want to add a specific area in the content section, click on Add Element at the bottom of the content section in the live editing interface, and select add link, button, text – heading or paragraph, image, icon, custom shortcode or widgets area.